A jar of weed grown in a commercial facility. The mayor Holyoke, a small city in Western Massachusetts, is hoping he has found the golden ticket that will save the area’s economy, and it comes in the form of legalized pot. Effective December 15, 2016 Massachusetts became the first East Coast state that will allow the sale of recreational marijuana and many cities are hoping the new industry will jobs and money to poorer areas (Massachusetts Legislation, 201). When recreational marijuana was first made available in Colorado there was a large spike in commercial cultivation facilities to keep up with the demand. The first week that marijuana was legal in Colorado stores sold over $14 million worth of recreational marijuana and this number continues to grow as more user adopt the practice (KansasCityFed). By the end of 2016 Colorado had given out nearly 500 permits to sell recreational marijuana and 700 permits to grow it, resulting in $1.3 billion dollars worth of marijuana being sold (KansasCityFed). 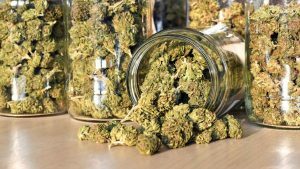 All of the marijuana sold in Massachusetts needs to be grown in Massachusetts which has resulted in 172 recreational cultivation license applications being submitted to Massachusetts’ cannabis control board from all across the state, showing that Mass is on track to follow Colorado’s cannabis boom (CCC). These facilities are almost exclusively indoor cultivation facilities that are housed in warehouses or greenhouses. Indoor grow facilities are utilized because of their ability to deliver a high yield of crops year round while protecting plants from any adverse environmental conditions and keeping the grow area within precise environmental conditions (Baptista et al., 2017). Indoor grow facilities produce as much as ten times more crops compared to traditional farms, making them an obvious choice for growing expensive crops like marijuana (Barbosa et al., 2015). In Massachusetts indoor grow facilities are used almost exclusively for large operations because of the long winters and short growing season that would drastically impact the growers overall yield. Consumers also demand a very high quality product when they purchase marijuana from a store and these products can only be grown in intensly regulated facilities. Without the use of indoor grow operations marijuana cultivators would not be able to produce enough high quality product to yield a reasonable profit. The major problem with controlled environment agricultural is the reliance on outside energy sources and the effect this energy consumption can have on the environment (Sanjuan-Delmás et al., 2017). However, greenhouses use significantly more energy than more traditional open air farms. The amount of energy utilized fluctuates based on the individual greenhouse because of differences seen in technology and construction, but it is inevitable that greenhouses will use more energy than traditional open air farms due to the equipment needed to produce a high yield of crops. A recent study found that greenhouses use as much as 160.5 MJ/kg while more traditional outdoor growing options like open air farming only uses 0.8-6.9 MJ/kg (Ntinas et al., 2016). Marijuana cultivation is considered to be one of the most energy intensive industries in America today (Warren 2016). In the United States 1% of the entire country’s energy use is spent on marijuana cultivation (Magagninia 2018). This can rise to 3% in cannabis rich states like California (Magagninia 2018). Most industrial grow facilities have large, overhead lights that replace the sun, bring water straight to the plants in the absence of rain, maintain precise air quality through the use of air filters and dehumidifiers. (NCLS). Each of these necessary tools needs a large amount of energy to function at peak performance. To grow a high quality product facilities must employ very specialized lighting units that provide a specific wavelength of light to optimize production. Different lighting systems can produce very different effects on the plants that can change the height of the plant, the amount of product produced, and the amount of THC and CBD found in the marijuana (Magagninia 2018). Lighting can account for 76-86% of the entire facility’s energy usage, which toals 2283 kW/hr per kilogram of marijuana produced (Arnold 2013). Unfortunately, cutting back on lighting isn’t an option either. Because of marijuana’s intense cultivation needs any compromise in lighting quality can gravely impact the amount of product yielded and the quality of the product. Another large consumer of energy within an indoor grow facility is the transportation of water to the facility and the method utilized to water the plants. Most facilities utilize hydroponic systems because of their ability to maximize crop yield while minimizing the amount of water being used (Barbosa 2015). However, the addition of hydroponic systems can increase the amount of energy needed to effectively operate an individual greenhouse (Cannabis Control Commision). Extra water handling uses approximately 173 kW/h for every kg of cannabis yielded (Mills, 2012). Large marijuana facilities are forced to use ventilation systems like air scrubbers or charcoal filters in their facility to help mitigate noxious gases or any other fumes associated with cultivation (Marijuana Facility Guidance 2016). These machines help remove any impurities from the air while maintaining safe working conditions for workers who will be subjected to the fumes all day. When studied these machines consumed 1848 kW/h for every kg of cannabis yielded (Mills, 2012). Despite their large energy draw, ventilation systems are imperative for maintaining a safe work environment while insuring the cultivation plants are not dumping a large amount of noxious fumes into the surrounding area. Marijuana is a very climate dependant plant that requires specific temperatures to grow as productive as possible. Most facilities are need to use air conditioners for a large part of the year because of the immense amount of heat being produced by the equipment being used, however, in Massachusetts facilities would also need to provide heat in the winter. Without air conditioning the plants would overheat which can impact the amount of product yielded and they could even be at risk of dying. Massachusetts’ winters are so cold that it would necessitate additional heat sources be provided or the plants could again face decreased yields or death. It was shown that the average facility uses 1284 kW/h for every kg of cannabis yielded on air conditioning and 304 kW/h for every kg of cannabis yielded on heating (Mills, 2012). When a system is continuously using large amount of energy the waste product of these systems needs to be considered. The introduction of greenhouse gases into the atmosphere is a leading cause of climate change that has been proven to warm the earth, resulting in melting glaciers, rising sea levels, warmer oceans, and more natural disasters (NASA). Indoor agriculture’s high energy needs often results in a high amount of carbon dioxide being produced as waste (Sanjuan-Delmás et al., 2017). A 70 m2 greenhouse heated solely by natural gas produced 2.9 kg CO2 eq./kg more than one of the same size that was heated by natural gas supplemented by solar power (Hassanien et al., 2017). Most marijuana grow operations do not follow organic production standards which have a 35%-45% lower carbon footprint than organic farming (Bos et al., 2014). This carbon being pumped into the environment can negatively impact the Earth by promoting climate change. Thankfully, there are renewable sources of energy that can be harnessed that have a much smaller carbon footprint while still providing a quality source of energy. Massachusetts has been slowly working towards more eco friendly energy solutions like energy that comes from solar panels, nuclear reactors, and natural gas. In 2017 68% of Massachusetts’ energy was produced by natural gas and only 4% of its energy from coal (eia). Solar panels are also gaining popularity and 1,867 megawatts of solar power was installed in Massachusetts in 2017 (eia) . Carbon emissions were also decreased by 19 percent from 1990 t0 2015 (Mass.gov). However, 27% of Massachusetts heating needs still come from oil (eia). Such a large and energy intensive industry that requires a large amount of heat could jeopardize Massachusetts goals to reduce carbon emissions and increase clean energy usage. One popular solution is the use of photovoltaic cells, also known as solar panels. The use of technologically advanced solar panels would help offset the shortcomings of greenhouse growing maintaining a high agricultural yield without contributing to global warming by releasing greenhouse gases. When solar panels are placed on an area that covers 20% of the roof of a greenhouse it can replace 20% of the energy necessary to power the grow site (Hassanien et al., 2017). In Massachusetts standard solar panels are able to produce approximately 1130 kWh of energy per year (Solar-Estimate). A large marijuana cultivation facility can use an upward of 210,000 kWh of energy per year, which would require approximately 185 panels to completely run the facility off of energy generated by panels (CPR.org). Energy use is directly linked to size and not all facilities are as large and energy dependant; they can be as small as a few hundred square feet or as large as 100,000 square feet (Cannabis Control Commision). Not only can greenhouse energy production be supplemented with renewables, but renewables could possibly meet all of a greenhouse’s energy demand. Previous marijuana grow sites have been able operate while only utilizing energy from solar arrays, making it likely that greenhouses in Massachusetts could do the same (Barok 2017). By adding solar panels to grow sites the amount of fossil fuels used will drop dramatically which will also combat the amount of carbon dioxide being produced which will ultimately help slow the rate of climate change. When compared to greenhouses that relied on fossil fuels alone to produce their electricity demand, ones that supplemented production with solar panels had a 29% lower carbon footprint (Ntinas et al., 2016). The potential for greenhouses to run largely off of solar energy while still producing a high yield of crops will result in a large cut to each facilities carbon footprint. The 240 solar panels they installed generated 440,000 kWh of energy in five years, which would have cost $88,000 and was more than enough to power the facility throughout the year (Barok 2017). A solar array of this size would make almost two times the amount of energy needed for an average facility that only consumes roughly 210,000 kWh of energy per year (CPR.org). Just one building was able to save 550,000 pounds of carbon dioxide from being released into the atmosphere (Barok 2017). Often times when considering the amount of energy used by indoor grow facilities it is tempting to offer solutions that involve less intensive cultivation practices that often use less energy. By using open air farming practices a cultivation site could use close to 23 times less energy than indoor growing facilities (Ntinas et al., 2016). The problem with less intensive production practices is that they often produce a lower yield of poorer quality cannabis. Growing outdoors leaves plants vulnerable to volatile weather, mold, and pests (Leafly). 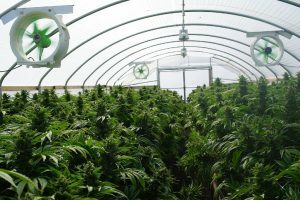 Massachusetts winters would also drastically limit the grow season for cultivators to just a few months a year, while indoor facilities could continue to produce products all year (Leafly). These drawbacks are not worth the potential energy savings. Solar panels are the best option for cannabis cultivators that are looking to reduce their carbon footprint through the use of low emission energy, but putting these practises to use might not come naturally to companies that are usually focus solely on profit. The availability of solar panels in America is at an all time high with energy subsidies projected to reach between $43 and $320 per megawatt hour for solar panel produced energy coming from tax credits that cover between 30% and 60% of wholesale prices (Maloney, 2018). Subsidies provided for solar energy bring the costs of energy provided by solar panels down drastically and continue to do so (Maloney, 2018). To further incentivise solar usage Massachusetts towns and cities should give preference to indoor cultivation facilities that utilize solar panels as their main source of energy. Towns have a high level of control when granting permits to businesses that are trying to grow marijuana within town borders (CCC). If towns made it known that they gave preference to facilities that utilize solar energy then incoming businesses would be more likely to implement solar technology as a way to get gain an advantage over their competition. This would also empower those looking to get a license to include as much renewable energy as possible as a way to maximize the chance that they would be granted a permit. Fossil fuels are not a clean source of energy and while reduction in use of electricity can help to lessen pollution, to effectively reduce greenhouse gas emissions more eco friendly energy sources need to be utilized. In an effort to reduce fossil fuel consumption, scientists have developed a multitude of systems that are able to produce large amounts of energy without releasing harmful gases into the atmosphere. One of the most common ways to harvest renewable energy is through the use of photovoltaic cells, more commonly known as solar panels. Because of the ease of production, limited drawbacks, and technological advancements surrounding solar panels it is widely thought that they will be the most abundant source of energy in the future (Schmalensee et al., 2015). One way to encourage greenhouses to make the switch from fossil fuel powered grid energy to roof- or ground-mounted solar panels is for the government to provide subsidies to facilities that use solar panels to provide the majority of their energy demand. If subsidies are provided, more facilities will start using clean energy, bringing the industry’s carbon footprint down (Maloney, 2018; Sanjuan-Delmás et al., 2017). In China, a different subsidy was proposed to provide greenhouses with between $62 and $140 per megawatt hour of electricity produced with solar panels (Wang et al., 2017). Although there is currently no such policy in China, solar powered greenhouses will help lead sustainable development and reduce carbon emissions (Wang et al., 2017). It is clear that if subsidies for using solar panels for energy production are offered, it will attract more users and bring the costs down while at the same time provide clean energy not produced by fossil fuels. These results could be replicated across Massachusetts as a way decrease the amount of carbon dioxide produced across the state. When considering ways to reduce our carbon footprint most Americans do not consider the role that agriculture plays in climate change. 60% of Americans believe that climate change is an ongoing issue but they tend to focus on emissions produced by cars, planes, and factories, rather than agricultural industries (Borick 2018). However, according to the Washington Post, “the nation’s booming marijuana sector is struggling to go green”. They state that analysts and state regulators say the cannabis industry, including states that have legalized recreational pot and those that offer it only for medicinal purposes, is outpacing many other areas of the economy in energy use, racking up massive electricity bills as more Americans light up. The county’s Marijuana Energy Impact Offset Fund, which tacks on a 2.16-cent surcharge for each kilowatt-hour of electricity used by grow facilities, is something of a model for other states, cities and counties that also recognize the growing energy drain that has resulted from the rapid expansion of legal cannabis (Wolfgang, B., 2018). By introducing legislation now that rewards the use of solar energy Massachusetts can incentivise new businesses to build more sustainable greenhouses from the onset. These eco-friendly greenhouses will reduce the amount of fossil fuels used and could drastically cut their carbon footprint (Ntinas et al., 2016). The one major hurdle for most growers is the initial cost of adding solar panels being prohibitive. They simply cannot afford the start up costs associated with adding solar panels to a facility and don’t believe that they can be a money saving investment in the long run. However, in one study done by Petru Maior University, they found solar panels payed for themselves in 6 years. After considering the initial costs of the system, yearly operating costs, taxes, and income a facility studied by Petru Maior University found that the initial investment was paid back after six years after saving money on their electricity bill and selling excess energy back to the electricity companies ( hydroponic greenhouse energy supply based on renewable energy). Solar panels also reduce cost because the energy is generated at the site where it is needed and there are no costs associated with transporting the power to where it needs to be (Borenstein 2008). Even when you consider the cost of yearly maintenance of solar panels, the amount of money saved with a reduction of the facility’s energy bill far outweighed the money needed to be paid (LG Energy). These savings jump quickly when you consider the high cost of electricity in Massachusetts where residents pay roughly 14.8 cents per kWh, the the ninth highest in the state (NPR :) ). Greenhouse agriculture, including marijuana grow houses, is a quickly growing industry that requires high amounts of energy that is currently supplied primarily by fossil fuels which produce large amounts greenhouse gases when burned (Shen et al., 2018; Sanjuan-Delmás et al., 2017). A shift can be made in the industry from fossil fuels to clean energy if subsidies are provided to greenhouses that use solar panels to supply their energy demand. Subsidies will incentivize greenhouse operators to use solar panels and will help make them more affordable to operators who may have not been able to afford solar panels otherwise. Subsidies will result in a reduction in the cost of solar panels over time as more facilities start to use them (Maloney, 2018). A reduction in the reliance on fossil fuels to lower our carbon footprint is essential if climate change is to be mitigated. Solar panels are a great source of renewable energy that are becoming increasingly popular and if utilized by energy-hungry greenhouses can greatly reduce their carbon footprint. By adding solar panels to grow sites the amount of fossil fuels used will drop dramatically which will also combat the amount of carbon dioxide being produced which will ultimately help slow the rate of climate change. A greenhouse growing marijuana intended for legal sales. consumption for tomato production in the iberian peninsula countries [electronic resource]. Acta horticulturae. 2012(9521):409-416. http://silk.library.umass.edu/login?url=http://search.ebscohost.com/login.aspx?direct=true&db=agr&AN=IND44639795&site=ehost-live&scope=site http://www.actahort.org/. doi: //www.actahort.org/. Baptista FJ, Murcho D, Silva LL, et al. Assessment of energy consumption in organic tomato greenhouse production – a case study. Acta horticulturae. 2017(1164):453-460. http://silk.library.umass.edu/login?url=http://search.ebscohost.com/login.aspx?direct=true&db=agr&AN=IND605853021&site=ehost-live&scope=site http://dx.doi.org/10.17660/ActaHortic.2017.1164.59. doi: //dx.doi.org/10.17660/ActaHortic.2017.1164.59. I know I am getting knowledge every dday by readinjg thes fastidious posts.